Since December last year the kids and I have used a few goodies off the new website Mrs Mactivity. They have a combination of paper craft activities and some learning activities aimed at the moment at the younger years (I would say key Stage 1 ages for their learning items). They offer a free membership and a premium membership which is currently just under £10. It is a newish website and they are constantly adding items but I thought I would share a few of the gems that we have found so far. We totally loved their egg matching number bonds and flower wreath colouring activity (both of which are free to download and perfect as a Spring or Easter activity). Learning wise they have English resources like these CVC word cards (free to download) and the common exception word sheets for Year 1 and Year 2 (both premium). My son did find the words that he needed to trace over a bit too small but he liked the fact that the list came with extra lines so he could add his own words. And some very useful FREE CVC Letter Shape Phoneme Frames. 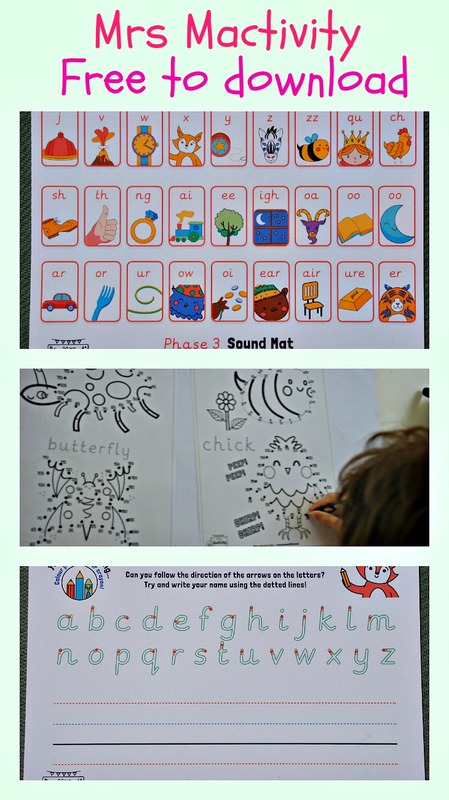 I used pages very similar to these when both my kids were learning their sounds. The Letter shape frames are really helpful for younger kids. They also have a FREE Name Handwriting activity – but you could use this for a number of activities not just for name writing. When my kids were younger I had a page like this laminated and they would practice writing all kinds of different words on the lines below. I liked using something like this as it had the letters above so when they were still learning how to form their letters properly they had a guide which they could refer to. My son has recently used some of their dot to dot pages – we used the FREE counting in 5’s version when we were practicing his skip counting for his 5 times table. And although the learning pages are too young for my daughter she has enjoyed some of their paper craft pages. She is currently going through a phase where she reads about 4 books at the same time (really not sure how she manages but she seems to love dipping in and out of the different stories) so she needed some extra bookmarks. She choose these cute Spring Bookmarks (these are premium). And I must admit they do look lovely. She also liked the more detailed Unicorn colouring page (also premium). This entry was posted in Homeschooling and tagged educational resources, free printables, home ed, home education, homeschooling, ks1 english, Mrs Mactivity. Bookmark the permalink.